A thin and crispy pizza. Think I am getting the hang of this now. Thanks for the recipe Abby! I like this one. This one was made with dough that had sat in the fridge for 48 hours previously. Baked at a scorching 260 C in my little oven at the weekend. Edit : Abby says it’s ok to post the recipe so here goes with my version of it: This makes enough for 5 225g pizzas. Combine all ingredients at least the night before you want to have pizza. Mix to a rough dough, leave for 20 minutes and then knead lightly either by hand or machine till you get a smooth dough which Abby describes as being somewhere between sticky and tacky. Put a little oil on a work top. Move the dough onto it. Coat your hands lightly with oil and stretch and fold the dough. Divide the dough into 5 225 gram pieces and round into balls. Figure out how to keep them in the fridge till you need them. I put mine in little plastic pudding bowls with snap on lids, which I had lightly oiled. Abby used freezer bags which she misted with oil. I didn’t use the dough for 48 hours, by which time it was pushing the lids of the tubs in the fridge. I took the dough out about an hour before I used it. It was a very warm day, so you might need to take the dough out earlier if it is cooler. I shaped the dough into pizzas using a floured worktop, some people do it with oil but I find flour easier, providing you use the minimum you need. I flatten the dough a little with the palm of my hand and then reshape it into a tightish boule. Leave it to rest for 15 minutes or so while I organise the toppings and put the oven on as hot as it gets and put the kiln shelf in ( my equivalent of a bread stone currently). 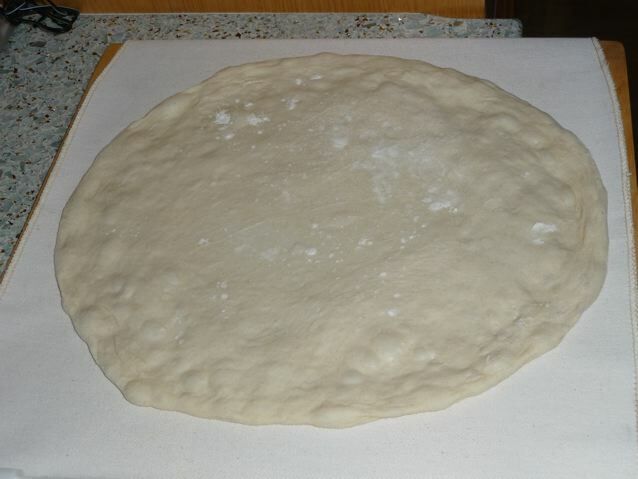 I’ve got one more pizza crust recipe to try as well that Oggi recommended… that one uses ice cold water. 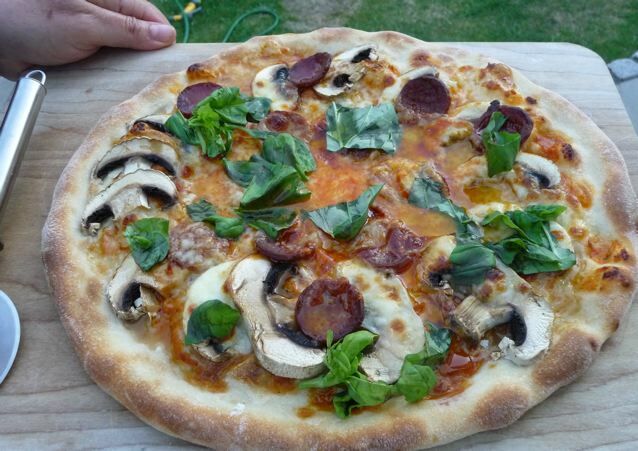 This entry was posted in Bread, Recipes and tagged Abby's pizza, Bread, pizza on 28/06/2010 by Joanna. Oh that looks deeeliiish! Did you put the basil on after it came out of the oven? Yes, basil and a little olive oil on straight after it comes out. :) Must have been pizza weekend. This was Saturday night consolation pizza. I do love your breakfast pizza! It was a pizza weekend, but it’s 4C here – I don’t know how you’re doing it in the hot English summer! Looks beauuuutiful! So glad you enjoyed it!! Did your sister ever try it? Curious about what you’ll think of the next one . . . . Delicious looking pizza. The dough looks superb. It was soft and quite stretchy and thought about going into holes. I would think it gets softer as the hours go by in the fridge. The recipe says you can keep it in the fridge for up to 8 days or freeze it. I haven’t tried freezing pizza dough yet. I routinely make a giant batch and freeze the little 8 ounce balls. Then I just pull three out the night before we’re going to bake, let them sit in the fridge overnight, and proceed. Works beautifully and an easy way to have pizza whenever the mood strikes! This looks fantastic. I usually put the basil on and cover it with some mozzarella before baking but I’m going to try putting it on after baking now. It looks so good. Homemade pizza is a revelation. We haven’t ordered pizza delivery in the past 2 years since perfecting our pizza routine. That is a pizza after my own heart – it looks really delicious Joanna. Ok, so now for the begging bit – is it permitted to share the recipe ? (I’ve been hunting for a ‘thin & crispy’ pizza base, but all I’m finding in my books are soft, bready ones). I don’t know if you like your pizzas to have a little ‘hot’ touch but one little Italian place offered a drizzle of a very ‘hot’ oil after the pizza has been cooked. It looks simply like a bottle of olive oil which has several VERY HOT peppers in it (granny’s bonnets?). Gives a lovely little kick and would be very easy to do at home too. Apologies in advance for words missing the letter ‘u’ but my keyboard is allergic to them and if I don’t re-read very carefully there are likely to be some bloomers! Ooh I like the idea of that hot oil! I once had a very simple pizza that was covered with garlic and butter after it came out of the oven, that rated quite highly. I’ve added the recipe to the post now. hi Joanna, have to agree with everyone’s remarks about how gorgeous your pizza looks, and looks like you’ve got a great compromise between crusty dough and nicely done toppings! Just wanted to mention that I tend to bake my own, however after getting fairly ‘cheesed’ (sorry!) off with the mess of using a peel and semolina flour, I’ve taken to heating a large, heavy-bottomed frying pan on the hob, whilst letting the grill heat up to max, then simply placing the shaped dough base into the red-hot pan, wait a minute then quickly put the tomato, cheese etc and stuff it under the grill until done to your taste. Welcome Marcus! I know exactly what you mean about the mess with the flour. The peel I use is a superpeel, the one with the rolling cloth, and you can get away with less flour using it. Your work around sounds excellent but I don’t think I have the right sort of frying pan, as mine have non stick coatings. I was just making some dough and thinking we hadn’t had pizza for ages too! Thanks for referring me to your lovely pizza. So symmetrical! I’m going to stash this recipe into my must-try folder. I didn’t know that pizza dough could be frozen. Brilliant! Did you try freezing any? It’s good to know that the dough benefits from a 24-hour rest. That’s what yesterday’s dough had, and it certainly had a nice flavour. I fighting back disappointment at the moment: Just made a large loaf shaped as a boule, and the silly thing blew out its side whilst baking. It looks like a tramps old shoe. Waiting for a taste test. Fingers crossed.